Here at Pashan kala, we offer you a wide variety of options in Black Marble Inlay Table Top on which you can use the top of your choice. These specially designed Table Top Bases have a class and elegant touch and can be used in the home, Further it can also be used in offices to give a aesthetic look to the surrounding ambience. 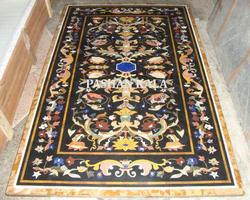 Looking for Marble Inlaid Pietra Dura Table Tops ?